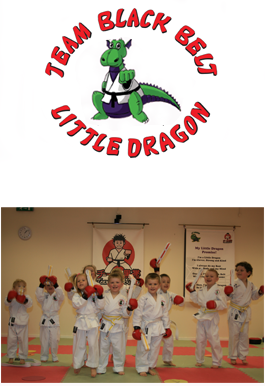 Our Little Dragons Programme is especially designed for ages 5 & 6 with fun, high energy classes. We believe the time up to the age of 7 is a crucial time in a child's development, and using games and karate based activities our classes are designed to enhance positive development in a fun and motivational way. Our programme encourages your child to become more confident and enthusiastic, with improved concentration and listening skills. This will help them to become better students at school, better listeners at home and more ambitious towards the future. Every child is unique and will respond to the challenge of new activities and situations in their own individual way. Some children will only want to do things they are certain they will be able to do well at. Our job is to encourage children to meet and succeed in all of life's challenges. Please note:Due to the young age of the children, parents are required to stay in the centre during the duration of the class.